N H Goel World School Sports Academy is managed by N H Goel Education Society as an independent body devoted to sports. 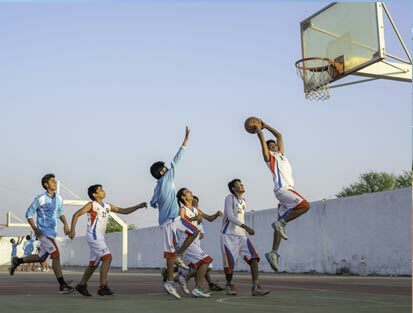 It believes in the positive power of sports to nurture the overall development of the child. Learning to play the game develops the physical and mental agility of a child and it is equally important that he/she understands the importance of team spirit and sportsmanship In a healthy body resides a healthy mind, and to keep the kids active and enthusiastic there are several sports activities. The school boasts of excellent indoor, outdoor sporting facilities including 3 Synthetic Hard Courts, 2 Lawn Tennis Courts, 2 Synthetic Basketball and Volleyball courts, a turfed Football Field and a Swimming Pool. We also have Chhattisgarh’s only 8 lane 400 metre Synthetic Athletic Track, which is IAAF Certified (International Association of Athletics Federation). 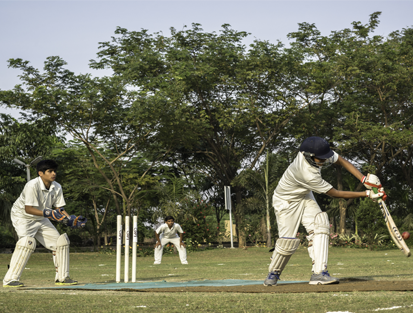 Professional training is imparted to all students by specially trained coaches appointed for Lawn Tennis, Football, Athletics, Yoga, Basketball, Volleyball, Skating, Swimming & Archery. Indoor sports like Billiards, Chess, Carom & Table Tennis are keenly pursued by the students. 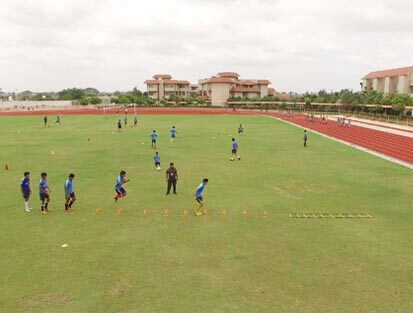 The excellent facilities have resulted in our school being given the privilege of hosting the 20th CBSE National Athletics Meet 2015, CBSE West Zone Swimming Tournament in 2013, CBSE Lawn Tennis Nationals in 2012. In Oct 2015 a Memorandum of Understanding has been signed between GMR Sports Private Limited (owners of Delhi Dare Devils) and N.H. Goel World SchoolThis MOU will remain in force for 5 years. The Opening Ceremony of the newly formed Delhi Daredevils & N H Goel World School Cricket Academy was held on 22nd June 2016 at 10:00 am. The current captain of Delhi Daredevils and former Indian International Cricketer Mr. Zaheer Khan & the Mentor of Delhi Daredevils Mr. T. A. Sekar were present along with other dignitaries from GMR Sports. The Chief Guest for the occasion was Shri Pramod Dubey, the Mayor of Raipur. Children from other schools apart from the students of N H Goel World School can be part of this academy. As per the agreement the selected students will be trained by coaches appointed by Delhi Daredevils who will with the help of the school staff impart coaching for 2 hours for 3 days in a week. A maximum of 100 students will be chosen initially. The aim of the academy is to impart professional training to its students. Making the students competent enough to stand on their own in any level of the game for their age group.